Stands The Test of Time! 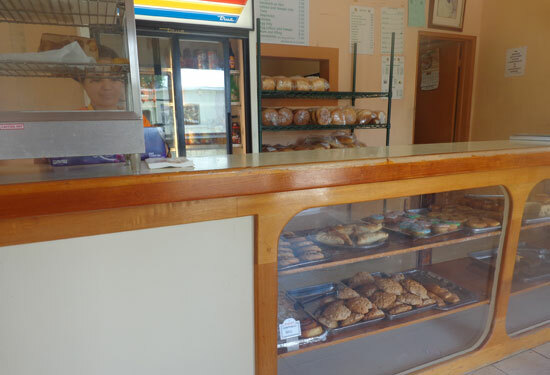 Serving up hearty and yummy chicken and tuna sandwiches, Jamaican patties and other savory and sweet treats, Mary's Bakery is a quick, cheap option for grabbing a bite. 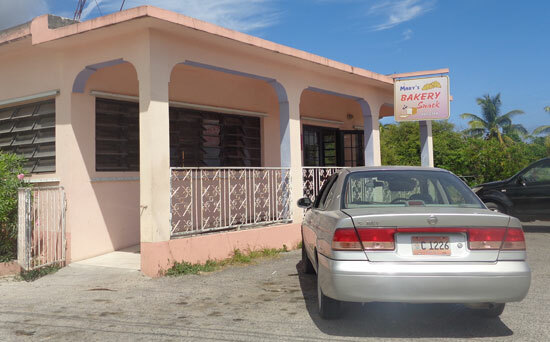 Quality, value and a remarkable story of hard-work all make Mary's Bakery one of Anguilla's most locally-loved bakeries, and one of my favorites. Until the day I spoke with Cherrille, the eldest daughter of Mary's nine children, I had not known the true magic behind the establishment I had been frequenting. Mary's Bakery was founded in 1968. It began in a house in Stoney Ground with Mary and two employees. Just look for the sign, you can't miss it! Those two employees (Nettie and Adelina) are still with Mary's Bakery today! Each time it moved to locations in The Valley area, before settling in its current spot on the road through The Quarter (which is the area just east of The Valley - you can find Mary's by heading to Proctors from The Valley). Mary's Bakery today, in The Quarter. 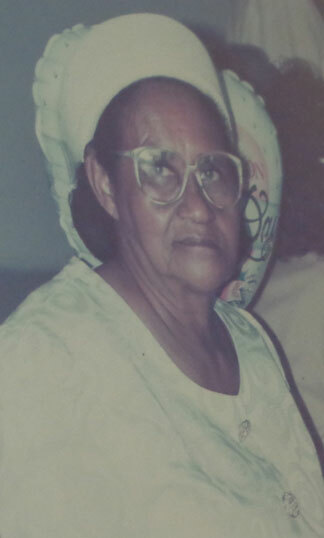 Mary Rogers, the bakery's founder and namesake, passed away in 2000. This image of Mary hangs on the wall in Mary's Bakery. When she started Mary's Bakery in 1968, she was just into her 40s and already an established professional photographer, seamstress, farmer, and baker. Mary used to make many of the wedding dresses on the island. In plenty of cases, she had also baked the wedding cake for the wedding and rode her bike to the church to cover the event as the photographer! Her talents didn't end there... her husband had taught her about photo development. She used her own dark room to develop the wedding photos she took, too! 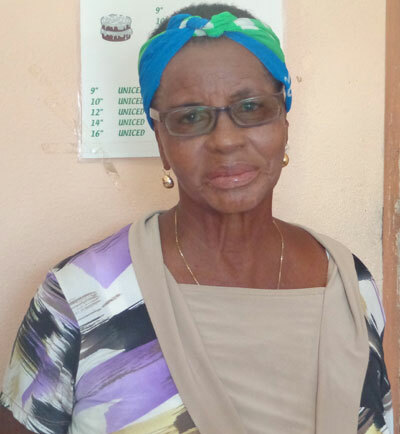 Mary's skills as a photographer and developer were also used in processing the passport photos needed on the island. A multi-talented, hard working mother was Mary. As Cherrille told me about her mother, I stared in awe. When I hear such stories of extraordinary people, I want to know as much as possible. My next question was, "are we eating Mary's recipes when we buy something here at Mary's Bakery"? I was not surprised to hear that Mary was an intuitive chef. She held most of her recipes in her head, never needing to commit them to paper. Say hello to one of the originals from 1968, the beautiful Adelina. Therefore today, you get a similarly tasting version of Mary's originals. Adelina, Nettie, and many family members were close enough to witness Mary in action and recall her ingredients and ratios. Naturally, over the years some items have come and gone. For example, Mary's Bakery will be adding a new vegetable patty as they currently serve patties filled with chicken, beef, and turkey. This will meet the recent demand of the vegetarian customer. They try to meet the needs of their customers and that's when change comes. Otherwise, they stick with what worked for Mary. What Does Mary's Bakery Offer? Tasty and Affordable Anguilla Dining! Mary's opens early in the morning and is ready for you at breakfast time with plenty of baked goods. You'll see everything from local sweet potato pudding (a Caribbean treat), to fruit turnovers, and cupcakes topped with colored icing and tiny sprinkles, which many locals would refer to as an "iced muffin". Tip: Some items under the counter may not be identified by labels, but don't be shy about asking what they are. You might find they have exactly what you want, or might discover something new and exciting. My favorite item to pick up for breakfast comes from the hot food warmer which sits to the left on the front counter. It is called a cheese roll. It is a dense and flakey pastry rolled up with seasoned cheese. It may not make for the healthiest breakfast, but it sure tastes good! During the day, that same hot food warmer will hold delicious homemade rotis. The rotis are filled with chicken and potato or a vegetable mix. Both are delicious. You'll also find the patties that I mentioned earlier. If you are in the mood for a sandwich, Mary's has you covered and gives you your money's worth. 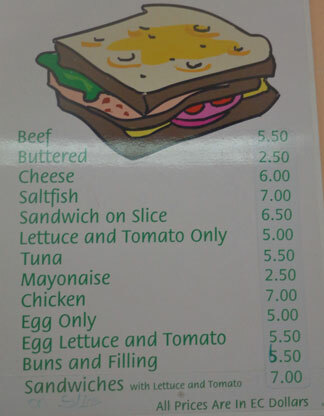 A modest signs lists their sandwiches but again, don't be shy about asking for something not on the menu. Typically, I stick to simple favorites: tuna, cheese, or chicken. These arrive on either a white sub/baguette type of bread, or on sliced bread. Your choice. 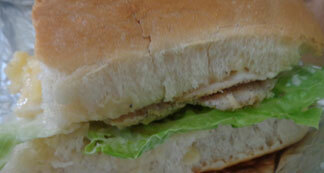 The sliced chicken with cheese, mayo, lettuce and tomato is one of my favorites. Slightly heavier, it will keep you full most of the day. Keep in mind this isn't a Subway where you point at what you want as they make your sandwich. That said, the folks at Mary's are accommodating and make sure you get what you want on your sandwich, as long as they have it. Fresh-baked bread, ready to go! Which brings me to the next topic... Mary's bread. Top sellers are the "sweet bread" (more widely known as raisin bread), multi-grain bread and sliced bread. 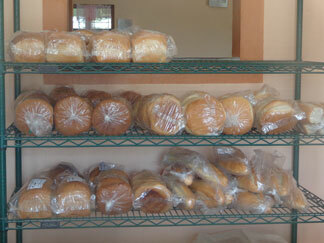 Mary's distributes their sliced bread to most of the major grocery stores on Anguilla. Just look for the Mary's Bakery label! Learn more about Anguilla's grocery stores, here. Mary's Bakery bread, the sub/baguette-style, often gets labeled as having "too much peff". What in the world is "peff", you say? The locals call the soft center of the bread peff. I've even seen some folks take their fingers and pull some of this soft part of the bread off of their sandwich. It's not because it tastes bad, in fact, it's nice and soft and fresh. I gather it's just too much food for some people hoping to eat more lightly. In my opinion, I'd rather pull some off than not have enough! with mayo, cheese, lettuce, and tomato. Wash all of that fresh baked goodness down with a bottled or canned cold drink from their fridge or some hot bush tea. On the counter to the right, Mary's Bakery serves a variety of local, hot bush tea. The kind depends on the kind of bush they can get. Lemongrass, soursop, basil... you can't go wrong. Tip: If you love hot tea and haven't tried local bush tea yet, put it on your list of things to do. Tasty's Restaurant serves a nice pot of bush tea at breakfast as well. Since there is no "fast food" in Anguilla, I tend to use Mary's Bakery like a fast-food restaurant... when I'm on the go. It is quick and easy. It also makes a perfect snack or lunch on a day at Little Bay, or a day at other fabulous, cerulean blue, pristine Anguilla beaches. Mary's travels well! There is space with tables and chairs to sit and eat inside Mary's Bakery and take it easy. 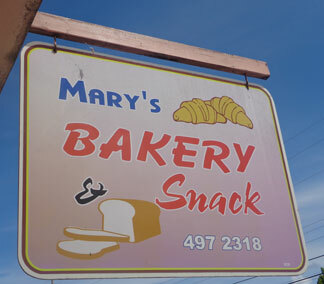 Whether you choose to eat-in, take-out, bring it to the beach or on an errand run, Mary's is a top choice bakery that stands the time, thanks to one trailblazing lady and her dedicated family and friends! Directions: If you are coming from Long Path (from the East End) it will be on your right after you pass Proctors, and before you reach the light at The Valley. If you are coming from The Valley, Mary's is located on the left before you reach the sharp curve in the main road. The Computer Superstore (a two-story building) is across the street from Mary's. Good for sandwiches, roti, Jamaican patties. Hours: Mary's is open from morning until around 8pm through the week. They are closed Saturdays and close early on Sundays (at Noon).